We, at Weddingz, have a profound fondness for everything hatke. The recent trend we’ve seen that’s being truly loved by Instagram and Pinterest-obsessed users is the photo booth. Earlier spotted only at casual parties, modern couples are now seen adopting this trend for their pre- and post-wedding photo shoot to cunningly capture candid moments of themselves and their guests too. Photo booths are a great way to add an element of entertainment for your family and friends and flaunt goofy poses with hilarious photo props. They’re also great to give your guests a memento they can take along as the most fun memory of your mehndi, sangeet or reception. However, these photo booths don’t come cheap. If you’re unable to squeeze this fun component into your wedding budget, we’ve got some really cool DIY wedding photo booth ideas that are a child’s play. Read on to find out how you can incorporate these DIY wedding photo booth ideas into your festivities. Add your own creative twist to give it a personal touch and get ready to say “Cheese”! Got a lush and scenic garden area around? Now find a strong, solid tree or fix up two sturdy poles on the ground that can hold up a giant oversized frame that can fit you two perfectly, yet have some space to accommodate a group of people. Have your name and wedding date written at the bottom for a personalised touch and keep some props handy. Have frames cut out in different shapes, like squares, rectangles and ovals, add some creative details to it and go crazy clicking! With these frames, it doesn’t matter what the backdrop is, you can simply make them stand against any background. You will be amazed with the final outcome. Show the world how madly in love you are by flashing some love quotes onto your photo booth. A plain board and quotes that represent you as a couple is all you need to create a fun backdrop. Got an old door handy? Give it a rustic look, decorate it with your favourite flowers and pose! Multiple doors also make for a great backdrop. Are all your wedding functions being held indoors? We’ve got some exciting ideas for that too! At school, did you or your fiancé get straight A’s or A+ in arts and crafts? Do you still possess a lot of creativity? Oh well, other than budget constraints, you landing up at this page is quite a proof that you do have innate creative skills to put up quite a show. DIY wedding photo booth is the best platform to validate and make it public. Find a wall that is exposed to good lighting and there you have your canvas. From aligning self-coloured or mix-match streamers, flowers or laces to splashing on some paint, if venue is your home, then of course there is no issue. But if it’s a rented property, get permission or opt out for this one; the options are limitless. Can’t get over the amazing feeling of Christmas or have your wedding date set during the season of Christmas? How about creating some lovely Christmas bows and covering up a portion of that wall? You could also get artistic with paper cranes, paper pinwheels or paper honeycombs in shades of your wedding theme colour. These structures have impressive 3-D backdrops. Tiny rice lights or bulbs, either ones look amazing when all lighted up against a plain backdrop. If you would want to hide the strings that hold the lights together, simply cover them with a plain-white light fabric drape for a sparkling effect. With this, we get on to our next choice of DIY wedding photo booth ideas. You can simply play on with the structure of drapes. No matter how you align them, they still look oh-so-stunning! However, the dramatic effect depends on your choice of fabric. 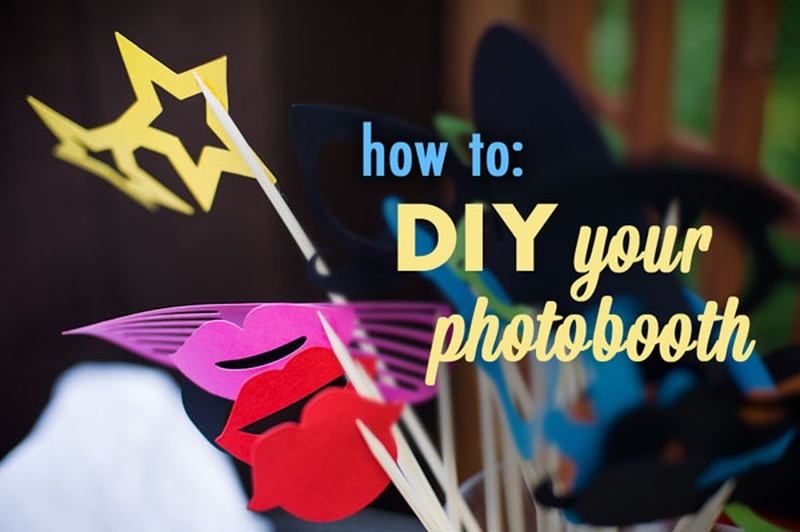 The simplest and effortless method of DIY photo booth is layering a wall with a wallpaper. You could prettify a dull wall with floral wallpapers or gold foil for a striking effect. Your wedding photographer is charging you extra for the photo booth job? Then the selfie station is here to your rescue. A selfie station is where you could have your guests take their own pictures (minus the assistance of your photographer) using a selfie stick. If you’re considering this, create a hashtag of your wedding; that way, it’ll be easy for you to collect all the images by requesting your guests to hashtag the pictures they take at your wedding. *Do run a few trials once you have your DIY wedding photo booth ready; you wouldn’t want all your hard work to fall flat on the D-Day. Which one would you give a shot at? Do send a few pictures of your DIY wedding photo booth at content@weddingz.in; we would love to feature them in our blog section.